Green Hills of Africa research papers are on Hemingway's book about an African safari. Another story that relates very directly to Hemingway’s life is that of Green Hills of Africa. This book is about Hemingway’s African safari and he claimed that its success was ruined by bitterness. The book does take opportunities to initiate many attacks upon the critics and it begins in Chapter One where Hemingway states that writers are ruined by listening to critics. He claims that if they believe the critics are right when they say you are great then you also have to believe them when they say that you are awful. It is said that many of Hemingway’s nonfiction work was a weapon in his long standing feud with critics and also with many of his literary adversaries. Green Hills of Africa is not viewed to be the real story of Ernest Hemingway, but it is considered what he put forth as the real story. Hemingway takes certain criticisms of these particular works and gives his own aesthetic opinions as replacements for what the critics have stated, thereby answering his detractors. Even Hemingway does not deny this as it has been found in many letters of correspondence to fellow writers. 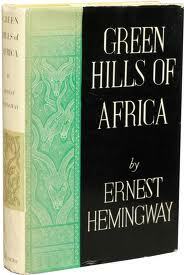 This book, Green Hills of Africa, then must certainly qualify as a book heavily influenced by Hemingway’s life. Paper Masters writes custom research papers on Green Hills of Africa, whiochbook about an African safari.